There are all sorts of activities that residents of various cities can participate in. This is where Gilt City comes in. The company employs curators who travel all around various cities in an effort to find offers that their customers would be interested in. They have a wide range of activities and services that their customers can use with special savings. The selection includes spa packages, concert tickets, outdoor adventures, fitness classes, and professionally-prepared meals. Gilt City has operations in various cities around the country. Some of these include Atlanta, New York, Miami, Los Angeles, and San Diego. However, they operate in quite a few more and certainly have plans for expansion in the future. The company is owned by the Gilt Groupe which was established in 2007. The group owns numerous brands such as Gilt Fuse, Gilt Home, Gilt Taste, and of course Gilt City which it created back in 2010. 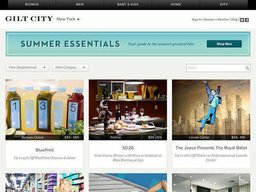 The company's website is located at giltcity.com. If you're looking to make use of the company's service in a more convenient manner than your computer offers, then you'll be glad to know that they have an official app. Users of the app will get real-time alerts for sales and learn about them before they are even officially released. One of the best things about using the app is that you can save up to 55% on purchases. It's available on Google Playstore and the iTunes store. Gilt City is in the business of forming partnerships with different businesses. If you own a business that you think could benefit from partnering with them, then you can easily get in contact with them via the website. It's a good way to increase the amount of foot traffic you get to your business. Gilt City helps promote your business in various ways. They will design a sales page for you. They can also promote your offer via social media on sites such as Facebook, Twitter, and Instagram. The website features a neighborhood directory. This particular section of the website outlines offers that the company has based on particular neighborhoods. These neighborhoods are broken down by cities around the country. When visitors arrive on the website, they will find various categories. Women can choose their specific category to see which offers would pique their interest. These offers include shoes, apparel like dresses, and jewelry. Men have their own category also with offers suitable for men. This section has different offers for accessories, shoes, apparel, and hiking gear. There is also a section for babies and kids. If you're looking for something for your home, then you should be able to find a suitable offer from Gilt City. The categories of offers under this section allow you to purchase merchandise at a discounted rate like decorative pillows, office supplies, furniture, rugs, candles, utensils, luggage, and more. Gilt City aims to provide customers with all the value they're looking for. However, you can still save money by using the services offered by Coupofy Coupons. After browsing the website, visitors will find a dedicated list of special offers for Gilt City that they can simply click on to be taken to their website for savings. You can pay for orders using any major credit card. They also accept Paypal for payment. Gilt City ships most orders via UPS. If you are shipping to a U.S. Post Office Box or military address, Gilt City will ship your order via USPS Priority Mail. It's important that you be sure of what you're buying before you buy it. The company doesn't offer any refunds as they consider all sales to be final.